Is It Time To Dial Back The Drug Ad Arms Race? : Shots - Health News A former executive at Merck argues the time has come for drugmakers to slow down on TV ads. Congress could help by making it possible for companies to cooperate on ads that don't feature specific drugs, he says. 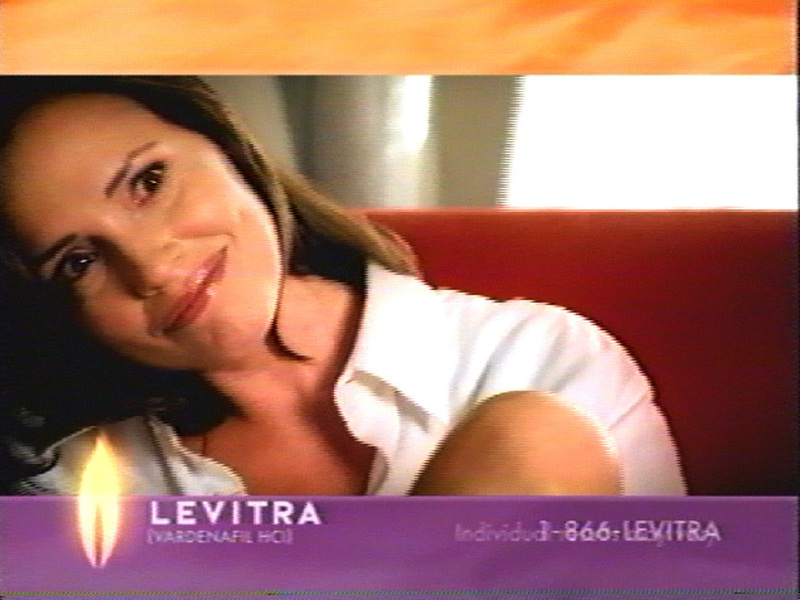 A woman talks about the erectile dysfunction drug Levitra in a photo made from a 2004 TV ad that's no longer aired. A few years back, a heretical idea crossed the lips of some drug industry executives. Maybe their warring armies of sales reps banging on the doors of doctor's offices were more trouble and expense than they were worth. In the middle part of the last decade, J.P. Garnier, since retired as GlaxoSmithKline CEO, said as often as anybody would listen that the reason he spent so much of the company's money on sales reps was because the other guys (especially Pfizer) were doing it. But other CEOs came to the same conclusion soon enough, and the new race became a contest to see which company could lay off sales reps the fastest. Now Ian Spatz, a former Merck exec in charge of public policy, lets us in on another industry marketing secret. Drugmakers, it seems, are having second thoughts about the $5 billion a year they're spending on TV ads for prescription medicines. So could the time be ripe for a reduction in drug company ad budgets? Maybe. In an op-ed in Thursday's New York Times, Spatz writes, drug company execs often buy ads "merely to blunt the impact of their competitors' ads." Sound familiar? And, furthermore, many of the companies' CEOs now see an unwelcome side effect from the TV ad onslaught. Consumers, bombarded with spots for drugs to treat everything from impotence to rheumatoid arthritis, now see pharmaceutical companies as marketing rather than research powerhouses. Though the ads sometimes seem as though they've been part of the TV landscape forever, it's only been since 1997 that the Food and Drug Administration has allowed ads that include a medicine's name and a description of its uses. Spatz writes that whatever misgivings drug marketeers have about them, the companies are "stuck with the ads." But he offers a prescription for change, one that would take action in Congress. What if lawmakers exempted drugmakers from certain antitrust restrictions so the companies could cooperate on ads for disease conditions without mentioning specific drugs? It sounds pretty fanciful, given the public's dim view of the drug industry and Congress' trouble getting things done. But even if Spatz' proposal doesn't get traction, maybe a public conversation could lead drugmakers to rethink their spending on advertising as they have for sales reps. If that sounds impossible, consider that just last month Deirdre Connelly, another Glaxo exec, announced in a speech that the company would no longer advertise impotence pill Levitra on TV out of respect for viewers' sensitivities.